We can never thank you enough for the absolutely wonderful “House Warming” you did for us. Our friends and family have not stopped calling to tell us what a grand time they had and how excellent the food presentation, the taste and the service were. 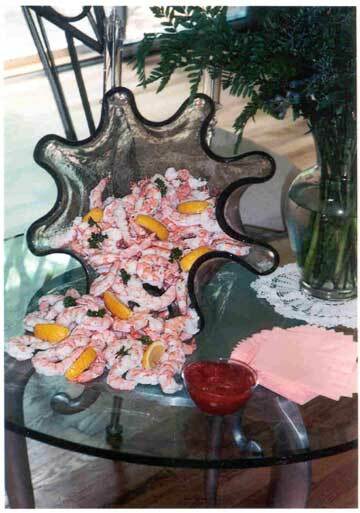 People could not get over how creative you were using my shell bowl for the shrimp and having them flow onto the glass table! The crab cakes were outrageous only to be topped by the beef tenderloin with the horseradish sauce and the Chicken Skewers. The crudite and the fruit were artfully displayed and so picturesque. The grand finale, the DESSERTS were out of this world! The Chocolate Strawberries, the Fruit Torte and the Raspberry Squares were beyond anyone’s imagination. Your attention to detail was unbelievable. Everything worked like clockwork. You made it so easy to be guest at our own party! Your staff was so accommodating and unobtrusive that it felt like they were guests along with ours. They were attentive, polite and receptive to the needs of our guests. What made this event even more amazing was that by the time you left, everything was back in its original place. All platters and serving pieces were washed, all the food was put away and the kitchen area was cleaned up so it never looked like you or 51 people were really here.” Again, our sincere thanks for creating such a spectacular day for us”.